End in Sight for Slipper Patent Fight - Gottlieb, Rackman & Reisman, P.C. On July 30, 2015, the Court Of Appeals for the Federal Circuit affirmed the previous decision of the Federal District Court in New York that High Point Design – and its customers Walmart, Sears and Meijer – did not infringe a design patent owned by the North Carolina company Buyer’s Direct and directed to a “fuzzy” slipper. Moreover, the Federal Circuit affirmed the decision of the District Court to throw out additional trade dress allegations of Buyer’s Direct because of its blatant lack of diligence in pleading a proper trade dress claim. At the core of the dispute is U.S. Design Patent No. 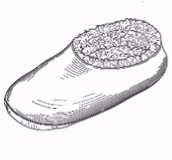 D598,183 (a picture from the patent is shown below), which encompasses the design of a rather ordinary looking slipper. Stated somewhat differently, the lawsuit was all about a non-descript, generic slipper design, for which design patent protection, in this author’s opinion, should probably have never even been granted. Following receipt of this cease and desist letter, High Point brought an action in the Federal District Court of New York in which it sought a declaratory judgment that Buyer’s Direct’s design patent was invalid and/or not infringed. The action was assigned to the Honorable Katherine B. Forrest. In response to High Point filing this action, Buyer’s Direct counterclaimed against High Point alleging design patent infringement as well as trade dress infringement. As to the trade dress infringement counterclaim pleading, Buyer’s Direct merely vaguely alleged that the Buyer’s Direct’s own slipper product, referred to under the brand name SNOOZIES, has a design that is distinctive and recognizable and therefore the trade as well as the purchasing public have come to associate the SNOOZIES design as coming from a single producer or source. This rather nebulous allegation was the only effort by Buyer’s Direct to identify and articulate the features of any trade dress and ultimately was fatal to the downfall of its trade dress counterclaim. In addition, Buyer’s Direct, in an obvious attempt to put pressure on High Point, also asserted claims for design patent infringement and trade dress infringement against High Point’s customers Walmart, Sears and Meijer, who were apparently purchasing the accused slippers from High Point. The claims against these retail customers were virtually identical to those which Buyer’s Direct was asserting against High Point. In February 2012, Judge Forrest issued a scheduling order which established March 16, 2012 as the date after which the parties could not amend their pleadings. Shortly after that deadline, with neither party taking any action to amend their respective pleadings, High Point and its retail customers collectively filed a motion for invalidity and non-infringement of Buyer’s Direct’s patent. High Point also filed a motion for judgment on the pleadings with respect to Buyer’s Direct’s trade dress counterclaim, arguing that Buyer’s Direct allegation of trade dress infringement was not pled with the sufficient particularity required by the Second Circuit for claims and counterclaims and therefore did not comply with Second Circuit law. For a design patent to be valid, it must not be anticipated by prior designs and must not be obvious in view of prior designs. In a decision issued in the Spring of 2012, Judge Forrest invalidated Buyer’s Direct’s design patent based on the legal doctrine of obviousness. 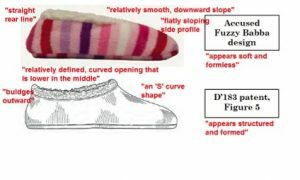 Judge Forrest found that the subject matter of Buyers Direct’s patent was directed to a “rather run-of-the-mill fuzzy slipper” which was well known and certainly obvious from prior slipper designs. Judge Forrest also dismissed the Buyer’s Direct’s trade dress counterclaim for two reasons – improperly and untimely pleading of the claim. Although Buyer’s Direct did request leave to amend its trade dress counterclaim so that it could attempt to comply with the trade dress pleading requirements of the Second Circuit, Judge Forrest refused this request since the deadline for amending the pleadings had already passed. However, both rulings of Judge Forrest were overturned by the Federal Circuit in a decision issued in September 2013 and the case was sent back to Judge Forrest for further proceedings. In essence, the Federal Circuit requested that the District Court provide more legal clarity and a better explanation of its reasoning. In her March 2014 decision, Judge Forrest also went into significantly more detail in again dismissing the trade dress counterclaim based, in large part, on indisputable evidence of Buyer’s Direct’s lack of diligence despite being on notice that its trade dress counterclaim was legally defective. Judge Forrest concluded that Buyer’s Direct did not “demonstrate …sufficient diligence to demonstrate good cause” under the Federal Rules. Summarizing the March 2014 decision, Judge Forrest invalidated the patent, found non-infringement, and dismissed the trade dress counterclaim. Buyer’s Direct again appealed to the Federal Circuit, but its appeal was more or less for naught as the Federal Circuit affirmed the decision of Judge Forrest, ruling that High Point and its customers did not infringe the design patent of Buyer’s Direct. The Federal Circuit held that the slippers of High Point were “plainly dissimilar” to the patent design. Agreeing with Judge Forrest’s conclusion of non-infringement, the Federal Circuit noted that the design of High Point’s slipper is “soft and formless” while the patented slipper was depicted as “structured and formed”, thereby creating a different visual presentation to the consumer. The below side-by-side comparison is telling to say the least. In summary, while the Federal Circuit appreciated that each of the slipper design depicted in Buyer’s Direct’s design patent and the design of the accused High Point slipper essentially consisted of a slipper with a fuzzy portion extending upwardly out of the foot opening, that similarity was simply not enough to result in design patent infringement. The Federal Circuit also affirmed the decision of Judge Forrest to dismiss the Buyer’s Direct trade dress counterclaim. The Federal Circuit unequivocally concluded that Buyer’s Direct “presents no persuasive explanation for why it could not have” pled a proper trade dress claim in a timely manner. This conclusion was based on the fact that Buyer’s Direct had whatever information it needed to state a trade dress claim and the fact that it had no explanation for why it was not aware of applicable Second Circuit requirements for pleading a proper claim. The Federal Circuit did uphold the validity of Buyer’s Direct’s design patent, effectively throwing Buyers Direct a bone. That said, it is quite apparent from its July 30 decision that the Federal Circuit was sending a message that it wanted to stop the four year old case from dragging out any longer.